The entire 1st Cavalry Division received deployment orders to southwest Asia on March 3, 2003. 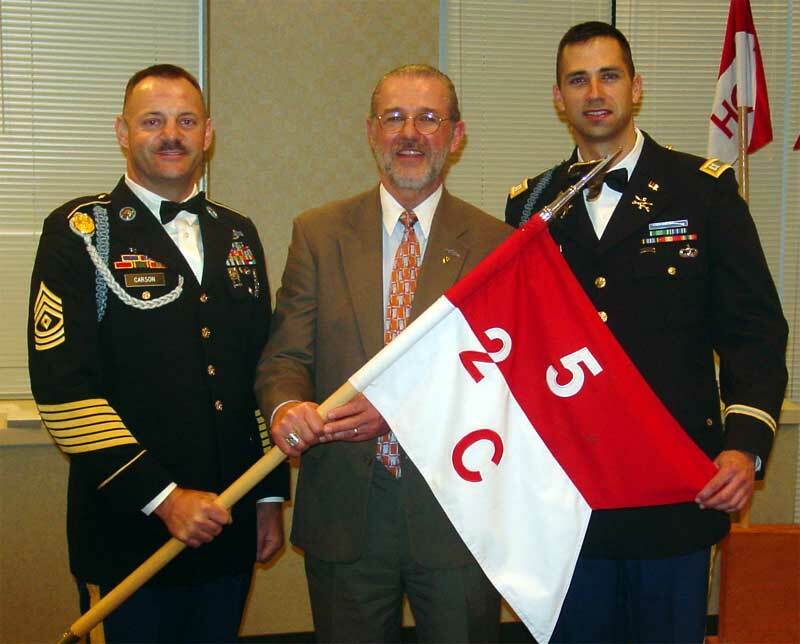 Because of the efforts of Charlie Dickey (artillery forward observer team, 1969), I was invited to represent C 2/5 Cav troopers of the Viet Nam era at a Dining-In. Most of us have never taken part in a Dining-In as we were a bit too busy in combat to hold one. It is a traditional, formal dinner celebrating the heritage of the regiment. It is full of pomp, dress uniforms, and speeches. It is also a time to drink, smoke cigars, and have a lot of fun. It was truly an honor and a privilege to join with LTC Gary Volesky (Battalion Commander), CPT Darrell Gayle (Commander of Company C) , First Sergeant Casey Carson, and the other officers and NCOs of the Battalion, in a final get-together before they ship out. I was proud to represent all the men who served with C 2/5 Cav in Vietnam - and to remember our men who did not return. The current day soldiers know of us too - the C Company Day Room is named for our Medal of Honor winner, PFC Billy Lauffer. I told them of the difficult task that lay ahead - - not in whipping the Iraqi army, but in upholding the honor and record of those of us who preceded them. As I looked out over the room, I have absolutely no doubt they will do just that! Keep today's troopers in your thoughts and prayers. Addendum: Since this page was written in March 2003, the deployment orders to Iraq were cancelled. CPT Troy Denomy assumed command from CPT Gayle on May 2nd, 2003. 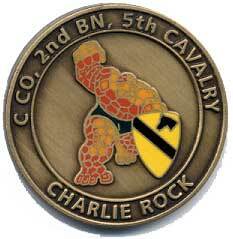 Most importantly, C 2/5 Cav now carries the name "Comanche" instead of "Charlie Rock." 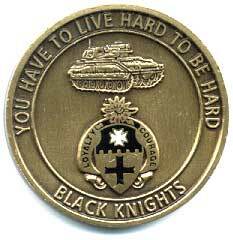 This pocket coin is carried by the members of C 2/5 Cav - shown actual size.